If you need help meeting our English language requirements, or if you'd just like to become more fluent and confident in English, consider a course at the Monash University English Language Centre. We offer three English programs to support your study or work goals. We tailor this general English language program to your goals. There are courses for everyone, from beginner to advanced, and you can study general English or academic English. Choose this option if you want to improve your language skills for further study, visa requirements or work purposes. If you met the academic requirements for direct entry into Monash College or Monash University, but narrowly missed the English language requirements, choose this bridging program. Once you've successfully completed it, you can enter your Monash course without any further testing. 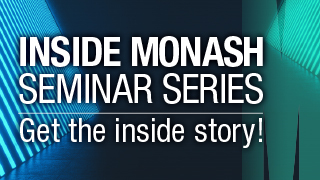 If you have a full offer to enter Monash, this dynamic and helpful five-week course will prepare you for academic life. You'll improve your English, and leave with skills in critical thinking, university research, academic reading, editing and proofreading, and referencing and citation. To help you settle into life at Monash, we offer academic and conversational English language programs, grammar and pronunciation workshops and lots of online resources. English Connect programs and services are free to all Monash students and are available on all of our Australian campuses. If you don't have a current IELTS, TOEFL, or Pearson test result, take the Monash English Placement Test. This free, one-hour English exam tests grammar, vocabulary, reading and writing. You can take it at any Monash-approved agent's office. Authorised by: Chief Marketing Officer, Strategic Marketing and Communications. Maintained by: Study at Monash University Webmaster Team. Last updated: Oct 2018.